We've seen the announcement at robots-dreams.com few days ago. From the text behind the robot I can see the name of a new servo KRS2552HV with 20kg-cm and new board RCB4HV. 20 servos. comes standard with wireless and probably gyro. sounds like fun. It seem KHR3-HV has a number of flexibility (extensions) including chest and arms. New Servo KRS-2552HV has 14Kgcm torque. I think so it has five extensions like servo size for optional adding. Two for elbow, two for hip and one for waist. I see other two extensions in the arms, may be for grippers? who know the name of the song anyway? That´d be "Go West" by the Pet Shop Boys. Order * After this page, it is enciphered by SSL and you can apply safely. 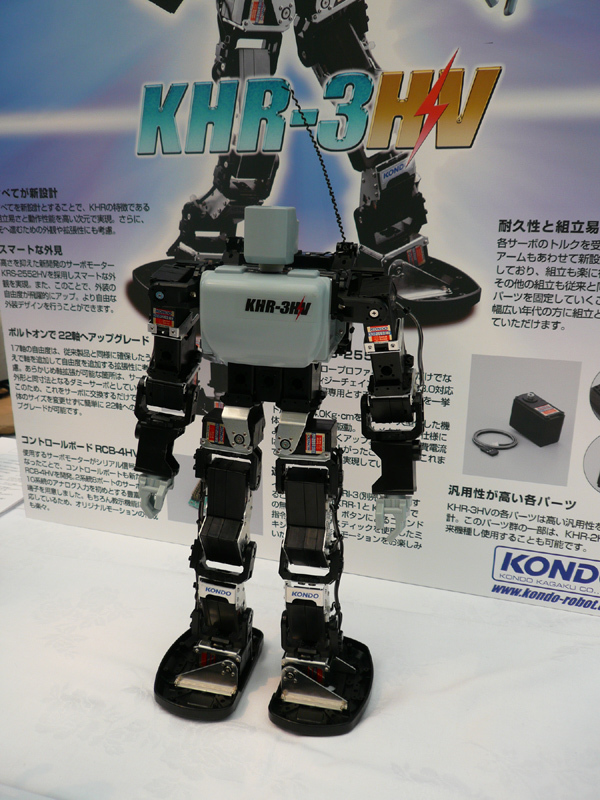 On this page, please carry out an advance order before putting KHR-3HV on the market. Please choose 代引き or a bank account transfer about payment. Although I am planning the end of July about goods sale time, it is about details. It notifies to our website at any time. Or I will contact you by e-mail. Please push the confirmation button of the bottom after filling in the quantity of the following goods. After having you confirm on a check page, an order is sent by e-mail. * I will limit for a receiver's address in Japan. We have more OFFICIAL information about KHR3HV. 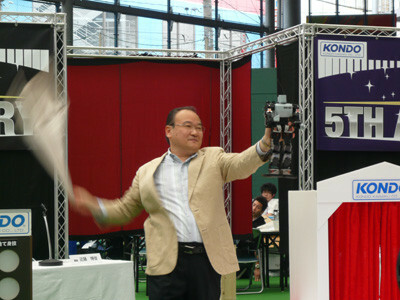 During its 5th Anniversary (June 13th 2009), Kondo Kagaku has released the brand new KHR-3HV. A new design, a new frame, much more DOF (dummy servo are included), a new stylish robot that will dramatically change once more the robot hobby market. Thanks to the use of serial servos, a digital chain is now possible. You can connect up to 17 serial servo motors KRS-2555HV. By using only one cable, it prevents troubles regarding disconnection. A design to ease and to smooth the folding of the knee has been enhanced. 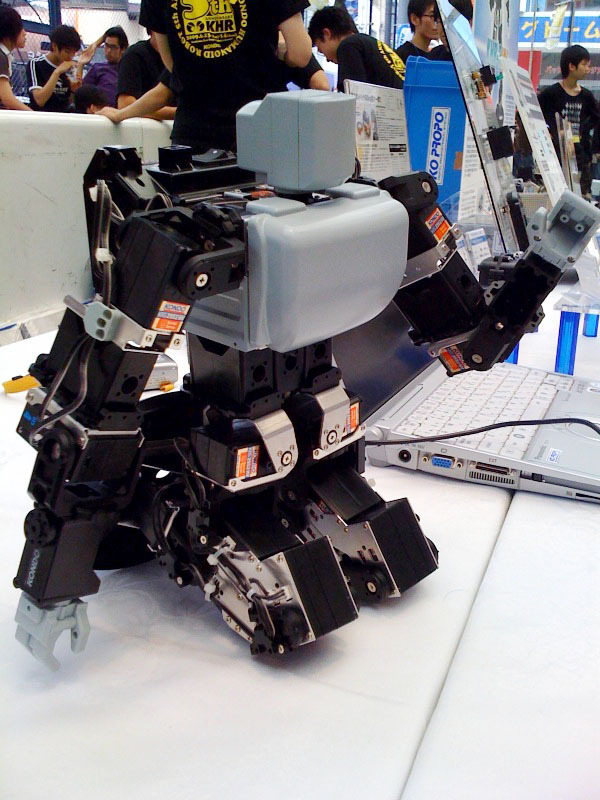 Thanks to the new design, the robot can retract and stand up faster from a sitting pose. become a real ally during robot competitions. Dummy servos have been added to the joints (hips, upper and lower arms). This new faculty will enable the user to add easily new joints and thus to set up new capabilities to the robot. The main frame cover is made out a light ABS plastic. It is easy to change to another body frame. 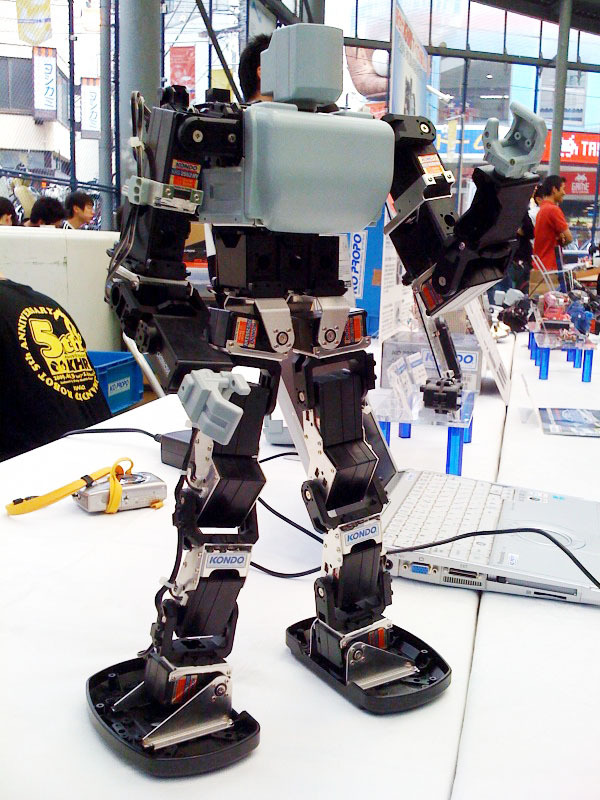 Thanks to the slim body, the user can handle the robot more easily. The new design of the back pack enables an easier maintenance of the robot. The user will be able to add easily sensors and motors. The new micro controller board RCB-4 enables to connect serial servos. It is compatible with ICS3.0 module and a wide range of options parts. The user will be able to control the speed of servos. The input and analog ports enable a wide range of capabilities. The new design of the sole gives a more secure walk. The new design of the servo head makes it possible to assemble it naturally to the shoulder. It gives the robot a more intrepid style. FYI the first of batch of KHR3HV has been produced. We at Robosavvy are planning on bringing it in during the next month or so. We will probably run a pre release campaign for KHR3HV where you'll be able to pre-order it but I'll announce further details in the near future as the first batch produced was made of very few units. 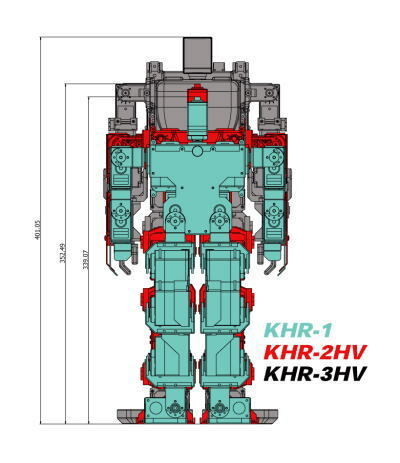 KHR3HV comes with 5 dummy servos that can be updated with a 5 servo pack for 5 extra DOF. The location of the servos I believe has been discussed in a post above. RAS 2 and KRG 4 are also compatible (not sure about KRG 3 - waiting for a confirmation). The new RCB 4HV controller board seems to have lots and lots of IO. I don't really know for sure the meaning of the abbreviations in the IO, but I believe SIO stand for Serial IO ports to connect servos (I think the servos work in a daisy chain model, since the board is said to support up to 35 servos). The 1x SW port I don't know what it is. The new Heart to Heart 4 software includes some nice new features. The most advertised one is the ability to work in a "Team" model. I don't know exactly what this means but I would believe it has some features for collaboration and maybe a revision control system (I read something like "now you don't need to worry that another team member may overwrite your data"). It is now also compatible with RCB 4 and the ICS 3 serial servos. Robosavvy has now started pre sales for KHR 3HV. Robots pre-ordered until next week should be delivered in the second half of August. We're offering the KRI-3 interface board with the first purchases of KHR 3HV. KRI-3 is an interface board necessary to connect Radio Control units form Kondo to KHR 3HV (such as KRC-3AD). Please note KHR 3HV is also compatible with KRG 3 and RAS 2 so it's .